IT'S BEEN a dizzying week and a half since Donald Trump was sworn in. It’s been chaotic in Portland, too, as the city and county try to figure out how to shield local immigrants and refugees from the grasp of Trump’s ever-flowing stream of executive orders. Minutes later, Grant Chisholm—one of the antagonistic preachers, who’d been heckling Spanish-speaking churchgoers earlier in the day—was splayed unconscious on the green PDX carpet, victim to a solid right hook to the head. On Monday afternoon, less than 24 hours later, a few hundred people gathered in downtown’s Terry Schrunk Plaza, where local immigrant activists, politicians, and labor leaders led a rally decrying Trump’s executive order. The document temporarily bans immigrants and refugees from seven predominantly Muslim countries from entering the US. Related: For the latest in information about rallies, marches, and political events, consult the Mercury's RESISTANCE & SOLIDARITY calendar. Want to publicize an event? 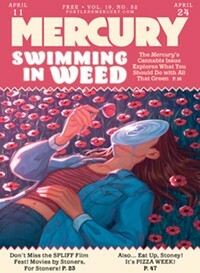 Send the info to calendar@portlandmercury.com. During the rally, two young men drove around the demonstration in a massive pickup truck with Washington plates, flying both a Donald Trump “Make America Great Again” flag and an American flag from the back. The passenger, 20-year-old Washington resident Sergey Antonov, is accused of flashing a gun at demonstrators, police said, and was arrested for disorderly conduct (Antonov denied everything to the Mercury, claiming his presence at the demonstration was “pure coincidence.”) Cops said the weapon Antonov allegedly brandished was a BB gun, but inside the truck was a real “AR-15 style rifle” owned by the driver, who isn’t facing charges. Prosecutors declined to prosecute Antonov on Tuesday afternoon. The incidents underscore rising tensions in the community since January 20, as citizens try to grasp new realities under President Trump. City and county leaders have labeled Portland and Multnomah County as “sanctuaries” where Trump’s deportation policies will find no help. Trump’s team, in turn, has called cities like Portland “dangerous” and promised to strip federal grant money from urban areas that protect undocumented immigrants (Portland received nearly $49 million in federal and state grants last year). “I am here to tell you today that we are not going to turn our backs on the most vulnerable people in our community because Donald Trump is threatening us,” County Chair Deborah Kafoury said last week. “Trump’s plan to turn local police into immigration agents promotes crime by destroying the community policing strategies essential for effective law enforcement,” Senator Jeff Merkley said in a statement. But there’s only so much that local officials can do. Plainclothes agents from US Immigration and Customs Enforcement (ICE) were in the Multnomah County Courthouse last Friday, asking people—just “brown” people, one attorney told the Mercury—for identification. In January, ICE arrested five “foreign nationals at or near courthouses in Multnomah County, according to an official with the federal government,” OPB reported. Likewise, Trump’s executive order banning immigrants from a number of predominantly Muslim countries has already had an impact on Portland. Portland resident Mo Farah—a Somali-born British citizen with four Olympic gold medals who was recently knighted by the Queen of England—thought he wouldn’t be able to return from training in Ethiopia to be with his family in Oregon after Trump’s hasty order was signed on January 27. “It’s deeply troubling that I will have to tell my children that daddy might not be able to come home—to explain why the president introduced a policy that comes from a place of ignorance and prejudice,” he wrote Sunday on Facebook. After the post gained significant traction, “travelers on British passports were advised dual citizens were affected only if they were traveling to the United States from one of the seven banned countries,” the Washington Post reported. Farah wasn’t the only one affected. Then on Monday, acting Attorney General Sally Yates—a career lawyer for the US Department of Justice and a holdover from the Obama administration as attorney general nominee Jeff Sessions awaits confirmation—refused to defend Trump’s ban in court. She said she wasn’t convinced it was legal. Trump appointed federal prosecutor Dana Boente to the position until, Trump says, Sessions is approved by the Senate, “where he is being wrongly held up by Democrat senators for strictly political reasons.” Boente will enforce Trump’s executive orders.